Defensive Maneuvers: Who is at Fault When They Cause a Collision? A car accident lawyer will carefully consider the facts and accident report. First instinct when suddenly faced with a stopped vehicle in the road may be to swerve in order to avoid a collision. Unfortunately, swerving into another lane may cause … [Read more...] about Defensive Maneuvers: Who is at Fault When They Cause a Collision? Road rage is a serious problem that can have very serious consequences. Twice this year in Missouri we have seen road rage taken to the extreme. An August incident ended with the offending driver taking his own life before being questioned by the … [Read more...] about Road Rage: Who Is at Fault When it Ends in a Collision? T-Bone collisions are responsible for at least 8,000 fatalities each year. A large portion of car accidents take place at an intersection and can involve ignoring traffic signals, speeding, or distraction. 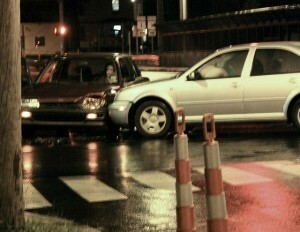 Sometimes the collision is broadside, or … [Read more...] about Who Is at-Fault in a T-Bone Collision?